Sometimes it's called procrastination. Or just being busy. Or having priorities straight. There are lots of reasons we have frogs hanging around. We put off the things we dread most. Or the ones that seem the most daunting, or not as urgent, or not as necessary, or things that will be frustrating or require special tools - or whatever. Anyway...I have a whole list of frogs staring me in the face with their beady eyes. And I've started chewing. Kinda rubbery and bitter, to be honest. But I made a huge dent in one this morning and victory is sweet. 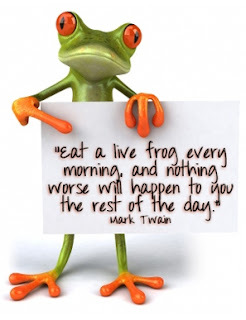 And it really does seem to be true that it is helpful to eat your frog first thing in the morning. I'm a "morning routine" girl, and I know there are certain things that I need to get done every day in order to maintain any semblance of order around here. These days, my "morning routine" actually takes all morning! Make bed...dress...kids to school...breakfast...dishes....clean kitchen...laundry...feed and change babies...naps and so forth. What (in other stages of life) could be an hour or less morning routine for me is actually, discouragingly, an all-morning thing. So I have adapted my every day routine philosophy. Sometimes, you need to postpone some of the daily stuff to get something done for tomorrow. In other words, my plate is fairly full with the basic tasks of meal prep, laundry maintenance, daily cleaning, etc. If I'm not careful, I get so busy keeping up with the daily tasks, I never get around to the "future" stuff. Things that help keep the future smoother...like deeper cleaning, sorting and decluttering clothes and toys, keeping clothes sizes updated and culled for 6 kids, planning and working ahead on projects, deadlines and events that are coming up. So I have worked "future" tasks into my daily schedule, but life has a way of happening. And kids, dishes, laundry, meals and church have a tendency to fill in and overflow the space. And then I find myself facing about a hundred thank-you notes that are getting embarrassingly late. Or the deadline on troubleshooting that computer problem gets frighteningly close. Or the season threatens to pass without me doing even one of the fun decorating projects I have planned. Leave the laundry. Eat the frog. The laundry will get done. I promise. Everyone will eventually start whining that they don't have any underwear. But frogs have a tendency to grow into large monsters. Or to hop away forever. Or both! Catch the frog. Pin him down. Hold your nose. Eat the sucker.